Nexus Arts, Fri 6 Oct.
First up in tonight’s program, Tracey Chen seemed more like Music In Introspection, while there certainly was a good audience connection, at times it seemed we were all crammed into her tiny Hong Kong bedsit apartment; the performance was that kind of intimate. With keys, synth, guitar, voice, loop pedal and lots of ‘found sounds’, there was plenty going on musically, through a brief set of teenage style songs, arranged with a repertoire of instruments. A pleasant warm-up towards the main event. Gaybird then took to the stage after an interval and stage rearrangement and along with Gaybird, there was illustration, lighting effects, video and programming, much of which was cued along the way. The composition was aimed at exploring time and space, both visually and graphically – a lofty ambition which in many ways succeeded. The visuals varied considerably along the way, from cartoon and anime to sci-fi and ‘amphetamine’. Syncing well with the composition through crescendos and pressure relief. Laser lights and beats certainly had hearts racing! The lasers and lights in particular were quite stunning at times and punctuated the composition brilliantly. In a well-considered slow point of the composition, stage-hands again changed the set around (initially quite unseen in the dark), removing light show elements etc. in order to fit Adelaide’s own Zephyr Quartet onto the stage, and to move Gaybird to front of auditorium, off the stage. At times Gaybird and the electronica were quite harmonious with the classic strings and at times jarring against them. In an exploration of times it was clear that Zephyr were giving a nod to various stages in western composition, from the baroque to more modern sounds, all part of Gaybird’s design. He both joined in with and played against the string parts building the tension and the overview to give us an idea of the broad scope of his musical nous, inviting us to join with him at times, at other times having us waiting for a chance to catch our collective breath. 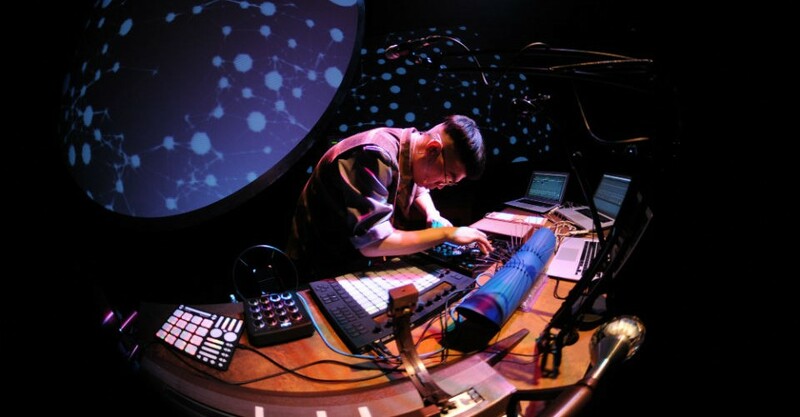 Instrumentally, Gaybird appeared to be armed with synth blocks, with pre-programmed algorithms and sounds to which he played and sang with, as well as keyboard and other elements, including percussion. At one point, accompanying the strings in a more modern style, he was playing bow on a set of springs, some of which looked like they’d been pulled from a reverb unit – so there was plenty of live and improvised music making going on along with the carefully composed musical segments. Billed for ninety minutes, the show lasted for over two hours all up. During which we were treated to modern Hong Kong composition, clearly influenced by the West, by the East, by classical and baroque of both traditions and by the modern world. Electronica, and strings set amongst some stunning visuals – plenty to enjoy – the audience lapped it all up! Electronica and strings set amongst some stunning visuals.